New Show Coming April 15th! The creators of Alba Salix, Royal Physician and The Axe & Crown are excited to announce a brand‐new podcast set in the fairytale kingdom of Farloria. But this one’s got a twist. Nobody knows what’s going to happen… least of all the participants! 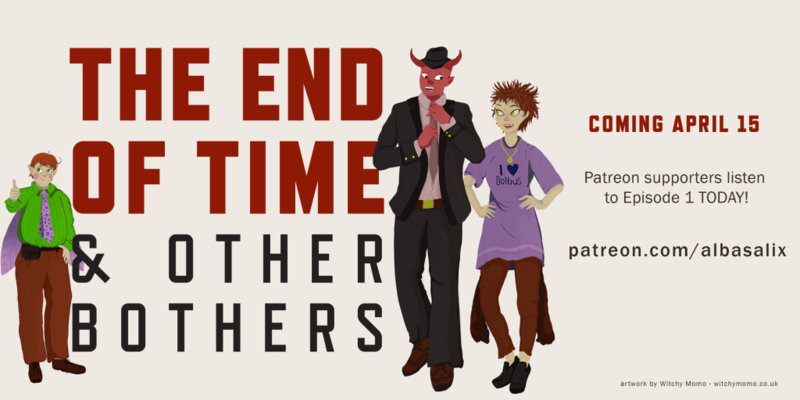 The End of Time and Other Bothers is an improvised fantasy roleplaying game set in the world of Alba Salix. Producer extraordinaire Sean Howard emerges from behind the scenes to head up this new adventure as the Game Master. It’s a tale of minotaurs, fairy cakes and cafeteria line workers, dystopian empires, magical waterfalls and mysterious books. Oh, and the end of time—that’s in there somewhere too. So join us on April 15th to hear how a half‐demon, a flightless fairy and a lowly human negotiate the pitfalls and perils of a world gone mad. They have no idea what will be thrown at them and Sean has no idea what they’ll throw back. This improvised fantasy roleplaying game can be heard every two weeks with each new episode released on Sundays. If you don’t tune in, you’ll have no idea what pneumatic tubes, fae stones and centaur pants have in common! You don’t want to be THAT person, do you? Subscribe to The End of Time and Other Bothers wherever you listen to podcasts.